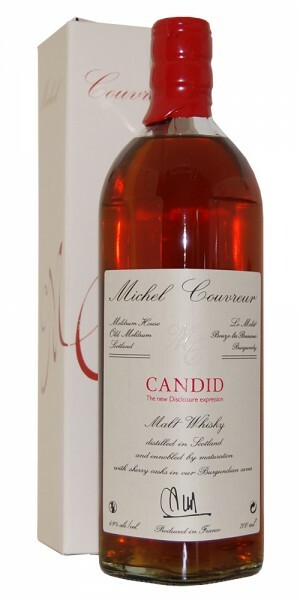 Produktinformationen "Couvreur - Candid Malt Whisky"
Dieser wunderbar frische, im Pedro Pedro Ximenez Sherry 250 l Fass, gereifter Single Malt Whisky, "The new Disclosure expression Candid" ist eine der neuesten Kreationen von Michel Couvreur. Ein sensationeller Geschmack, sehr intensiv am Gaumen, weich, mit einem weichen Lakritze Touch. Rund, sehr voll, eine leichte Frische mit einer pfeffrigen Würze. Eine Braunfärbung mit rubinroten Reflexen. Gerösteten Mandeln, Floral und sehr intensive in der Nase. CANDID MALT WHISKY - The new Disclosure expression. Amazingly expressive young whisky! Malt distilled in 2006 and matured in deeply humid caves within intensely Pedro Ximenez impregnated media botas (250 liters). Four selected casks blended together to obtain regularity of taste.53% natural strength decreased at bottling time to 49% per volume. Amber tint with ruby reflections. Mellow with roasted almond notes with a soft pungency. Floral and intense nose. Recalling "Intravaganza" fruity and spicy tastes. Intense to the palate, very mellow with a soft peaty liquorice touch. Power-full slightly toasted. Almond freshness with peppery spice. Nice thirst-quenching fruity taste. Gentle peat and liquorice are essential to its depth. Reminiscent of "Michel Couvreur Disclosure" available in 2008 : iodine distillate matured in a fresh PX cask providing a mellow and peaty balance.